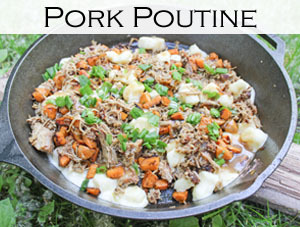 Need a simple camping recipe? 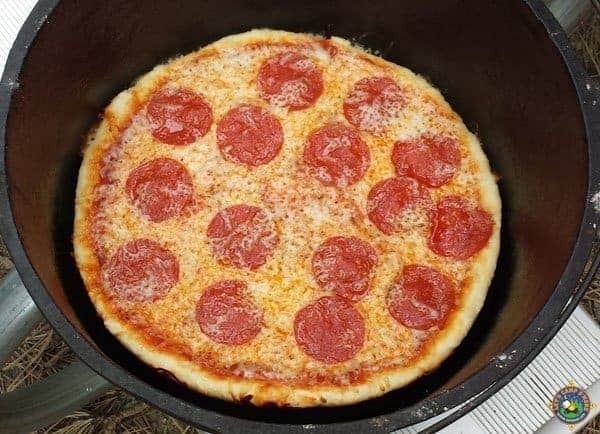 Try this Dutch Oven Pizza Recipe made with refrigerated dough. We are easy-going people and we like simple solutions to everyday life. That may be why we like camping so much. Don’t get me wrong, camping is a lot of work! But it is worth it. We spend a lot of time planning and making food for camping. Many simple recipes taste better prepared over the fire or in cast iron. We love baking things in our dutch oven. We love to dump in ingredients and then set it to cook. 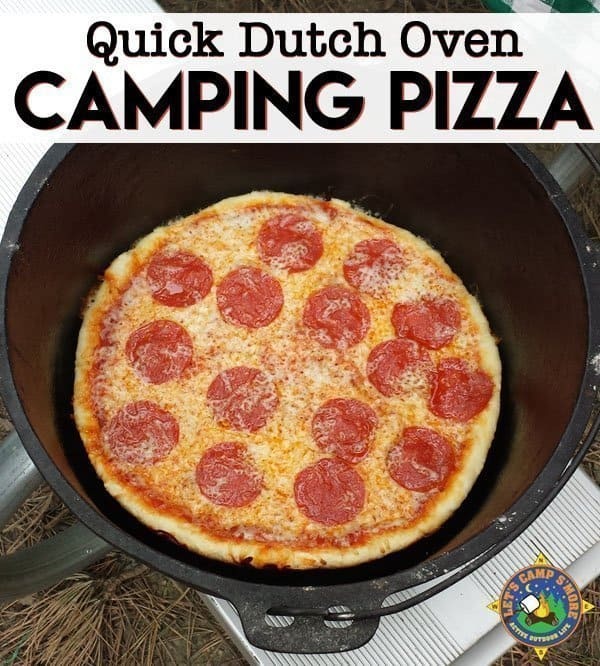 This Dutch Oven Pizza is very quick and easy to prepare. 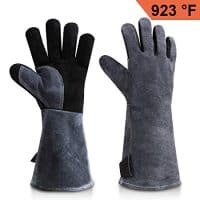 Get the kids to put it together while you prepare the charcoal. This recipe uses prepared ingredients. 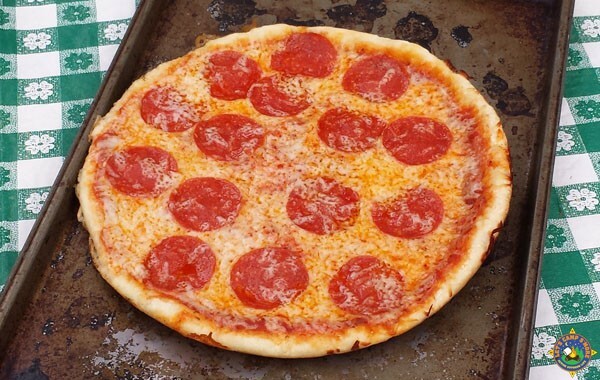 All you need is refrigerated pizza dough, pizza sauce, shredded mozzarella cheese, and your favorite toppings. We went simple and just used sliced pepperoni. You can see how straightforward this recipe is below. Please note: We used a 10″ dutch oven. 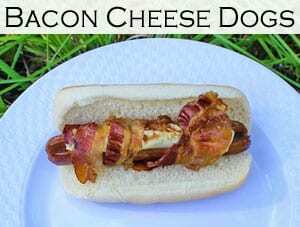 You can use cooking spray or dutch oven liners for this recipe. 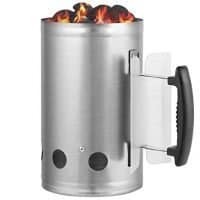 Prepare charcoal for your dutch oven. Spray the inside of the dutch oven with cooking spray or use a dutch oven liner. Roll out the pizza dough and press into the bottom of the dutch oven leaving a little lip around the edge. Spread the desired amount of pizza sauce on the dough. Sprinkle the desired amount of cheese on the sauce. 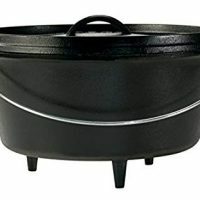 Place the lid on the dutch oven. Arrange prepared charcoal in a small circle and place the dutch oven on top. Arrange the remaining charcoal on the lid of the dutch oven. Bake for 20-35 minutes or until crust is desired crispiness. The dutch oven pizza turned out really well. The cook on the crust was fantastic. Using cast iron definitely elevates the store-bought crust. I would assume this tastes even better with homemade crust. 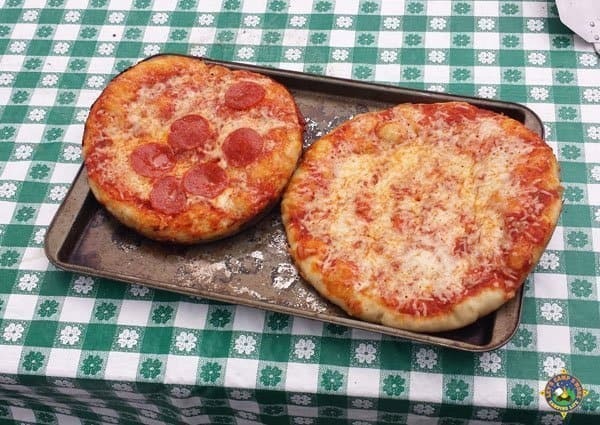 Have you ever made pizza while camping? What are your favorite toppings? Elevate premade pizza dough by baking it in a Dutch oven. Spray the inside of the dutch oven with cooking spray or use dutch oven liners. What a great recipe for a camp pizza! Your post is awesome and thanks so much for sharing it with us at Full Plate Thursday. Have a great week and come back to see us real soon! Thank you for hosting each week, Miz Helen.